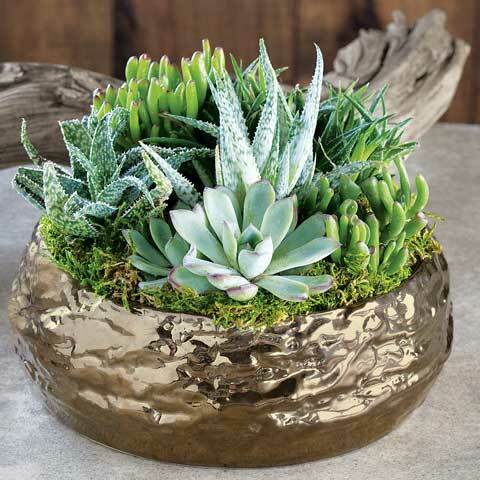 Within a gilded gold-toned metallic ceramic vessel, a variety of exotic succulent plants creates an elegant and easy to care for accent. 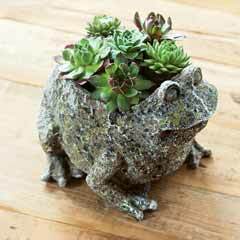 Potager measures approximately 9" in diameter by 7" tall and requires 2nd day shipping. 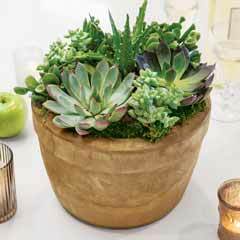 - Gilded Succulent Potager is an easy to care for arrangement of potted succulent plants. 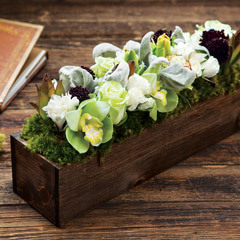 Gilded Succulent Potager is rated 4.6 out of 5 by 35. Rated 5 out of 5 by Flitta from Beautiful presentation I sent two out for the holidays and they were both a big hit! Rated 5 out of 5 by Patrish from Perfect Gift! We bought this as a Thanksgiving gift to send to someone for a different touch. They all loved it! Wonderful to have a choice of something lovely but unique to send, knowing it will get there on time with the utmost care. Rated 5 out of 5 by tai275 from Perfect Bought this for someone dear that was starting a new job. It was perfect and hope it spends many years on her desk. She loved it. Rated 2 out of 5 by Sue1 from Smaller than photo Looks bigger, fuller and more lush in picture - Sent as anniversary gift and very disappointed given the price and cost paid for shipping. 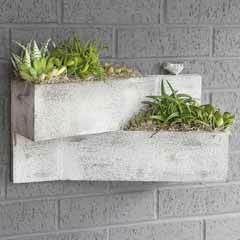 Plants were very small and "filling" was brownish grass instead of anything green. More grass than plants. Rated 5 out of 5 by JustJacky from Excellent Gift I bought this for a Birthday gift for my daughter. She loves it. It is very pretty and unique. I read the other positive reviews and that helped make my decision. Rated 5 out of 5 by Mickiw from Absolute perfection I bought this for the center of my patio table and not only does it look stunning, it gets compliments every day from my guests and neighbors. Lovely, easy to care for, and a delight.